I am happy to report that the three or four inches of snow that fell on Friday is gone, gone, gone. Goodbye, and don’t come back until next winter! 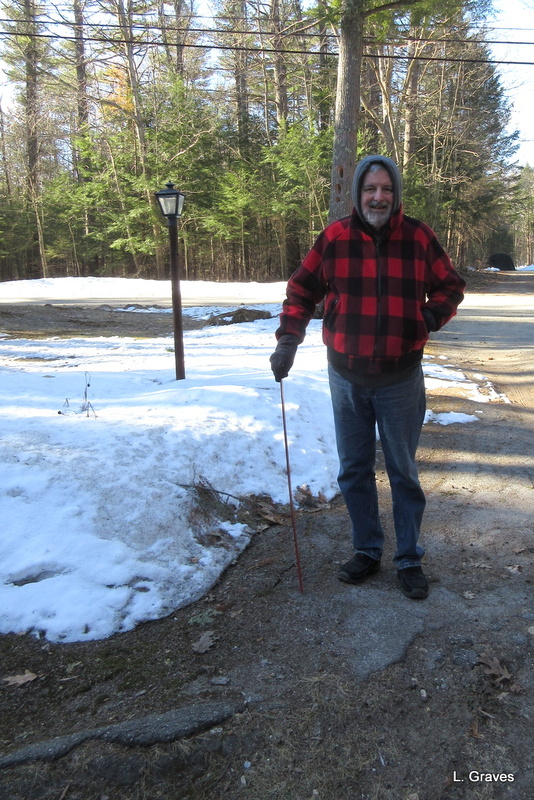 But Winter is not quite done with us yet, and she has given us a blast of cold weather that is more than a little brisk: 25°F and very windy. Although he put a brave face on it, Snow-gauge Clif shivered as I took his picture this morning. But I am getting ahead of myself. 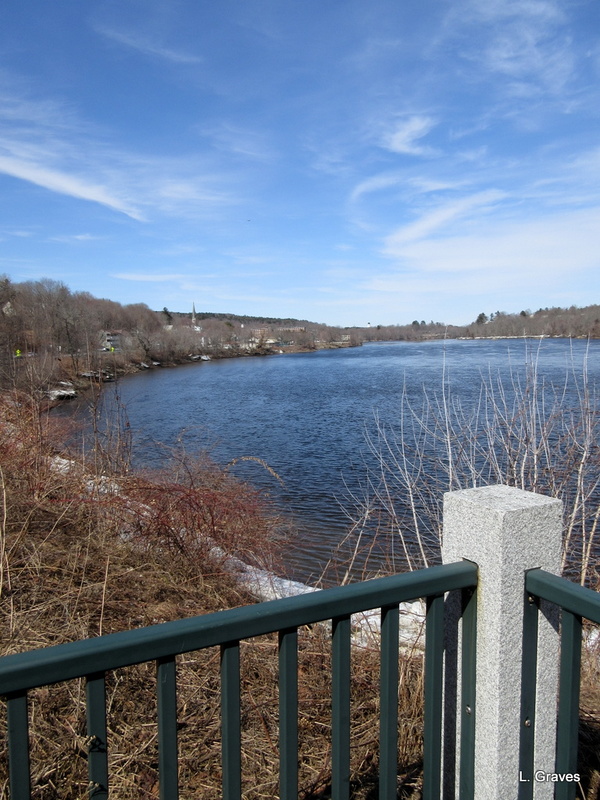 On Sunday, we went to Hallowell for a picture of the Kennebec River. 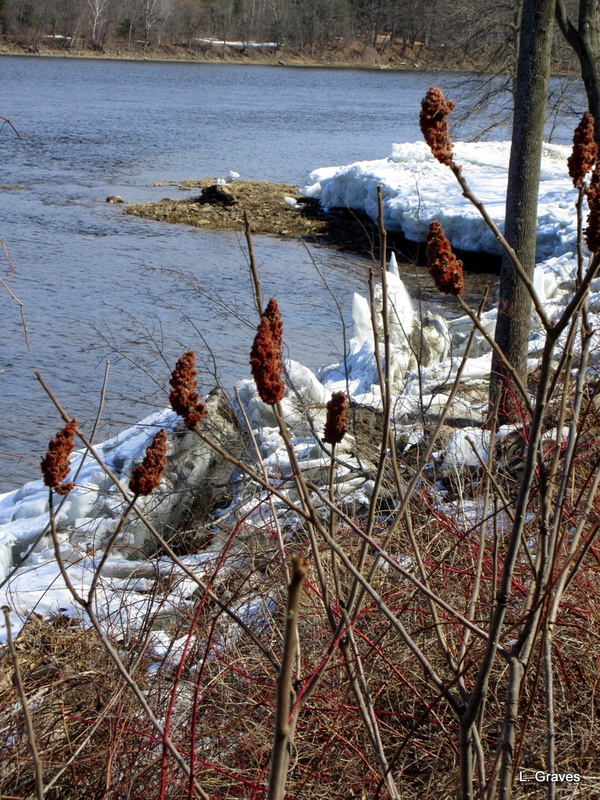 Despite the snow, despite the cold, the Kennebec is nearly free of ice. Oh, the blue of that sky and water! But the ice chunks aren’t gone. Not quite yet. I’m wondering how many weeks it will take before they finally melt. Now, back to Narrows Pond Road with a ta-dah! 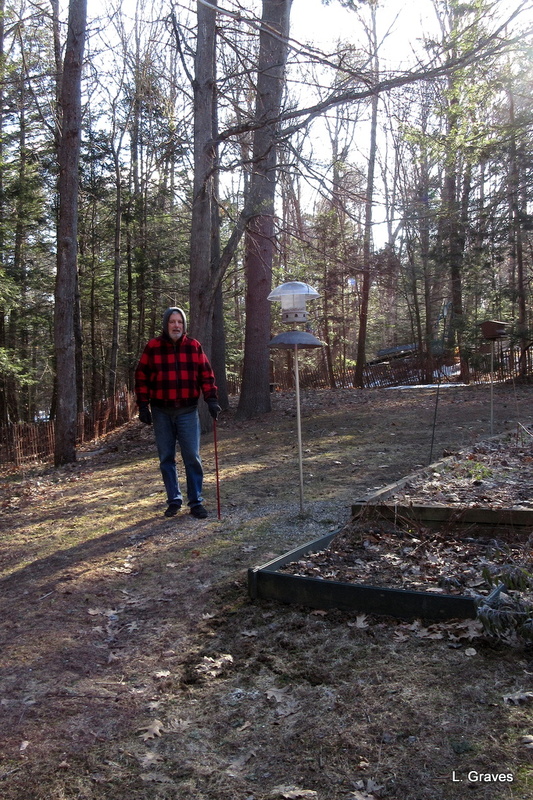 The snow is nearly all gone from the backyard, and thus Snow-gauge Clif’s job there is done. Not enough snow to worry about. In fact, it’s time to think about raking. Unfortunately, the same can’t be said for the front yard, which is much shadier than the back. Snow-gauge Clif’s job is not quite done. But let’s return to the backyard, where I saved the best for last. Another ta-dah, ta-dah! The snow is nearly gone from the patio, and it’s not even close to April 22, Shannon’s birthday. What do you think? One more week? Such excitement on Narrows Pond Road. Stay tuned! Yay!! It’s gone down fast! 🙂 That patio will definitely be cleared by my birthday. Crossing fingers that you guys get a warm up soon. It’s been cold down here too (not as cold as you but in the 40s and 50s which is cold for us this time of year) – but we’re suppose to hit 80 by Friday so the warm up is coming!! We will welcome warm weather. What a chilly spring it has been. And a cold winter. We’ve been rooting for, you Shannon. Glad to see you’ll get your patio party. May your birthday and your next year be a grand one. We would do that, too, if the budget allowed. Ugh, here in New Jersey we lost a big tree and TONS of branches from bushes and other trees. I have never seen such a mess out there – not even close. It has been quite a winter and spring. Very destructive storms. It seems to be unseasonable chilly everywhere. My sister in London says it was freezing there and I, in Italy, have suffered a day of cold with wind and rain to boot. Crazy, crazy weather. The new normal, I’m afraid. Have a wonderful time in Italy. Will there be a post or two about it? I so enjoy traveling around London with you, and I know I’d enjoy Italy, too. If you have the time, of course. Of course I will have the time and there will probably be far too much about Italy by the time I have finished! Yay! Your posts always so interesting. You know just how much to put in and just how much to leave out. Despite the cold weather, things are progressing. Oh, your poor Clif, shivering out there pretending to enjoy being a snow gauge! I hope he rushed inside and had a hot drink, pronto! It’s good to see the snow disappearing so quickly! But having it get too hot too soon is never a good thing. Clif was thrilled to be getting three cheers from the Aussies. And the Canadian neighbor. What fun! What a great day to have a birthday as April 22 is Earth Day. Oh, I hope you get your much-needed rain. I think we may need to report you to Husband Protectives Services–that poor man! 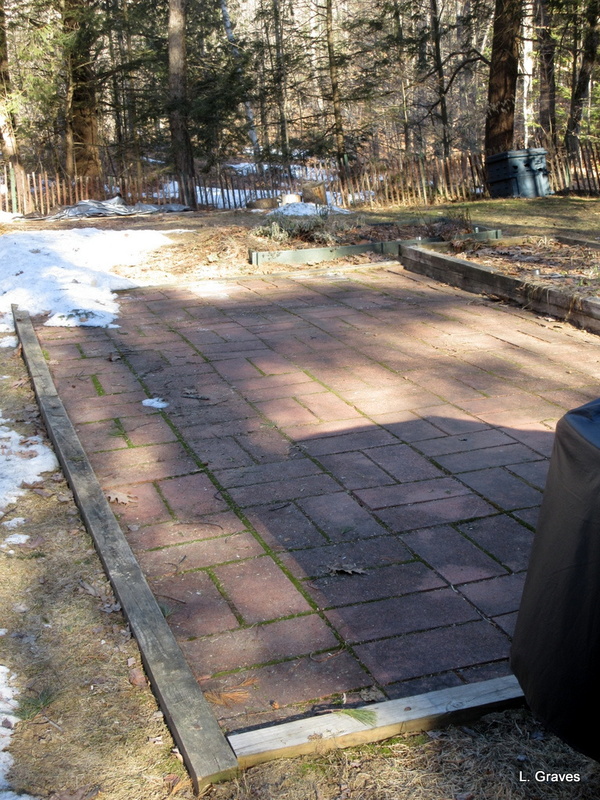 Your yard looks like ours, in that post-snow, pre-grass dingy stage–but we know what’s coming soon! Yes, snow-gauge Clif suffers a bit as he does his duty. The yard is a mess right now. Hard to believe that in a month or so, we will actually want to sit back there. Melting here as well. I love Hallowell! The wind ( Monday, dreadful!) is what takes the breath out of me! That wind was fierce and cold. Two little finches are perched on our deck rail. The female has tufts of nest building goodies in her beak but is doing a little dance with her feet because the rail is crusted with frost and it’s 23 degrees out. Let’s hope it warms up before her babies are born! The snow is almost gone from the patio. I can hardly believe it considering how much snow there was a couple of weeks ago. Looks like a thaw is slowly progressing. It snowed here Sunday night, the snow was mostly gone by Monday afternoon. By today it was actually warm, but more snow predicted for the weekend. Spring just doesn’t want to come this year. We have freezing rain predicted for tomorrow. Sigh.